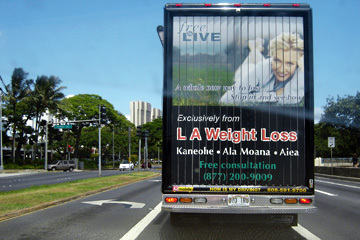 Billboard trucks such as this one in Honolulu are now banned in Hawaii. The Outdoor Circle is praising a new law that extends the state's billboard ban to include vehicles displaying paid advertising. Over the last few years, so-called mobile advertising trucks have appeared on Oahu streets. The Legislature passed a bill this session banning mobile billboards, and Gov. Linda Lingle signed the measure into law last month. "This is a big step in the right direction to help keep Hawaii free of billboards," Bob Loy, director of environmental programs for the Outdoor Circle, said yesterday. The law applies only to paid advertising and does not affect the Center for Bio-Ethical Reform's anti-abortion trucks picturing a large fetus, since they do not pay a commercial company to have their message driven around. Penalties for violations range from $200 to $2,000 for the first offense and can go as high as $5,000 for repeat offenders. The law also bans advertising vehicles or trailers from being parked on private property that can be seen from any public place. But it does not ban banners or other advertising on trucks or buses whose primary purpose is transportation rather than advertising. The last company selling mobile advertising -- Salem Media of Hawaii -- stopped driving its ad truck around last month when the governor signed the bill making the practice illegal. Rudi Camello, the ad truck sales manager, said there was a demand for the service, but now the truck will likely be put up for sale, probably to a mainland company. Another company, Admobile of Hawaii, apparently went out of business several months ago. Loy said another bill supported by the Outdoor Circle to put limits on political signs in yards passed the House but did not survive in the Senate. The Outdoor Circle, an environmental group founded in 1912, will be holding a news conference next week to promote voluntary guidelines on political yard signs during this election season. Loy said the environmental group will try again next year to pass a law to put limits on political and other yard signs.